The Larson Electronics HBLP-REMG-1MLED-B-PND LED Explosion Proof High Bay pendant mounted emergency light fixture with remote emergency battery backup provides operators with a powerful and energy efficient alternative to traditional hazardous location luminaries. LED technology and compact design makes this lamp an excellent replacement upgrade option for bulky and high maintenance cost older fixtures. This LED emergency light fixture features an emergency backup battery with an explosion proof enclosure. The battery can be mounted up to 1000` away from the light fixture itself. With a reliable battery, bright LED light, and explosion proof rating, the HBLP-REMG-1MLED-B-PND provides operators with a versatile and reliable lighting solution. This Class I Division 1 & 2, Class II Division 1 & 2 Group B (hydrogen) and Class III Division 1 & 2 explosion proof emergency LED light fixture provides 10,000 lumens of high quality light while drawing only 150 watts. The copper free aluminum alloy body is powder coated for added durability and an attractive aesthetic appearance. Special heat dissipating design in conjunction with LED technology helps this fixture to achieve an excellent 60,000 hour rated lifespan with 80% lumen retention. Light weight and a low profile make this unit an attractive alternative to larger and heavier older fixtures and requires less hardware to install. The included backup battery with explosion proof enclosure increases this LED emergency light fixture`s versatility and the overall safety within a hazardous work environment. 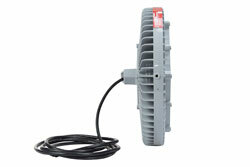 This light is multi-voltage capable and can be operated with 100-277 VAC, 50/60Hz without any need for a special ballast. The aluminum body and LED lamp give this light excellent durability and resistance to vibration and impacts. 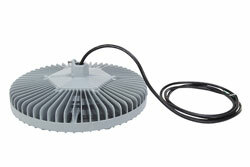 The housing is specially designed to dissipate heat which increases the efficiency and lifespan of the LED luminaries. The LED lamp produces 10,000 lumens with a color temperature of 4000K or 6000K and a color rendering index of 70 which produces colors and details much more accurately than high pressure sodium or mercury vapor luminaries. The HBLP-REMG-1MLED-B-PND can be pendant mounted by bringing down a conduit to the light fixture. We also offer the HBLP-1MLED-B-SFC, the surface mounted version of this product. Emergency Battery Backup: The remote mounted battery backup system included with the HBLP-REMG-1MLED-B-PND is a sealed lead calcium battery with a built-in charger and circuitry held within an explosion proof case. The battery can then be mounted up to 1000` away from the actual light fixture. In the event of a power outage, the battery will automatically kick in and provide emergency power to the light fixture for a minimum of 90 minutes. The battery provides power to the input side of the fixture, including emergency ballast, and allows the connected fixtures to be turned on/off without affecting operation. Once normal power is restored, the built-in charge will automatically begin recharging the battery which will be complete after 72 hours. 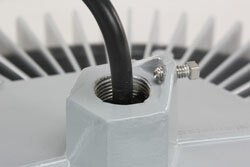 The emergency backup enclosure has two 3/4" hubs for connecting power to the enclosure and for connecting the remote emergency backup to the light fixture. Mounting Option Notes: Pendant mounting option requires conduit be supplied by the installer. 10. Emergency battery backup with Group B explosion proof enclosure. *5 year warranty replacement on this LED light. After 30 days, the customer ships the failed LED light and/or LED bulb to Larson Electronics at their expense. If the failure is a manufacturer defect, we will ship a new replacement to the customer. If failure occurs within 30 days of receipt, Larson Electronics will provide a return label via email to the customer. When the failed light is returned, Larson Electronics will ship a new replacement.